Summary: The differential diagnosis between intracerebral necrotic tumors and cerebral abscesses is frequently impossible with conventional MR imaging. We report two cases of cerebral abscesses that showed high signal on diffusion-weighted echo planar imaging and a strongly reduced apparent diffusion coefficient. This appearance was not present in our cases of necrotic/cystic gliomas (eight cases) and necrotic metastases (two cases). We believe that diffusion-weighted MR imaging may be a diagnostic clue in cases of cerebral “ring-enhancing” masses. Both patients were examined with routine MR and diffusion-weighted echo-planar imaging on a Siemens Vision 1.5-T unit (Siemens, Erlangen, Germany). MR imaging included axial T2-weighted fast spin-echo sequences (parameters: 5000–6000/128 [TR/TE], one or two signals acquired; a 6-mm section thickness; an echo train length of 23; a 192 × 256 or 230 × 512 matrix; and a 184 × 205 or 230 × 230-mm field of view) and axial T1-weighted spin-echo sequences (parameters: 600/14 [TR/TE], two or three signals acquired; a 6-mm section thickness; a 220 × 256 matrix; and a 230 × 230-mm field of view) were obtained before and after an injection of gadolinium. Diffusion-weighted imaging included an axial echo-planar spin-echo sequence (800/123, 10 or five signals acquired; a 6-mm section thickness; a 128 × 200 matrix; a 280 × 280-mm field of view; three b values (0, 300, 1200 mm2/sec); a sensitising gradient in the z direction in all cases, and occasionally in the x and y directions). The duration (δ) and the amplitude (G) of the pulsed gradients were 26 ms and 0, 11, 22 mT/m, respectively. The distance between the leading edges of the two pulsed gradients (Δ) was 59.7 msec. The apparent diffusion coefficient (ADC) maps were calculated in the z direction and the calculations of trace were not performed. A 51-year-old man was admitted after the onset of a major epileptic seizure. 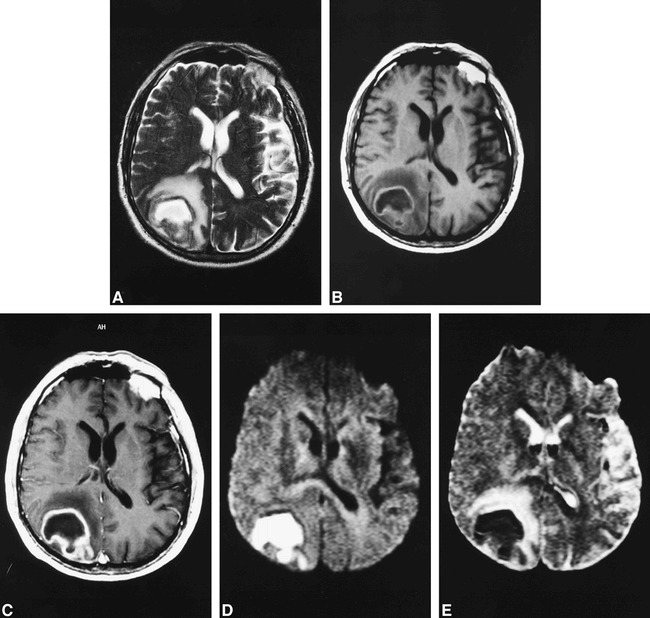 The CT study and conventional MR imaging (method described above) (Fig 1A–C) did not enable differentiation between necrotic glioma, metastasis, and abscess. The diffusion-weighted echo-planar image (Fig 1D) and corresponding ADC map (Fig 1E) revealed a strong reduction of diffusion inside the lesion. The ADC values were in the range of 0.25–0.33 × 10−3 mm2/sec. Surgery revealed an abscess with a positive culture of Streptococcus intermedius, Fusobacterium nucleatum, and Actinomyces meyeri. 51-year-old man with cerebral abscess. A—C, T2-weighted fast spin-echo (5000/128/2/6 [TR/TE/excitations/slice thickness]) (A) and T1-weighted spin-echo without (600/14/2/6) (B) and with (C) gadolinium injection show nonspecific “ring-enhancing” mass. D—E, Diffusion-weighted (“z” sensitising direction) multishot echo-planar sequence (D) (800/123/5/6) and corresponding ADC map (E) show central hyperintensity on diffusion-weighted image with very low ADC values (.25—.33 × 10−3 mm2/sec). A 70-year-old man was admitted after an episode of acute vertigo and dizziness followed by Jacksonian seizures. CT and conventional MR studies (Fig 2A–C) performed the same day yielded findings consistent with necrotic glioblastoma. The correct diagnosis of abscess was made because of the high-intensity signal on the diffusion-weighted echo-planar image (Fig 2D) and the reduced ADC values (in the range of 0.21–0.34 × 10−3 mm2/sec) on the ADC map (Fig 2E). The surgery confirmed the diagnosis of a brain abscess caused by Streptococcus anginosus and Fusobacterium nucleatum. 70-year-old man with cerebral abscess. A—C, T2-weighted fast spin-echo (5300/128/2/6) (A) and T1-weighted spin-echo images without (600/14/2/6) (B) and with (C) gadolinium injection show nonspecific “ring-enhancing” mass. Initial radiologic and clinical diagnosis was necrotic glioblastoma. D—E, Diffusion-weighted (“z” sensitizing direction) multishot echo-planar image (D) (800/123/5/6) and corresponding ADC map (E) show important decrease of diffusion with very low ADC values (.21—.34 × 10−3 mm2/sec) suggesting diagnosis of abscess. Brain abscesses are potentially fatal lesions that may be treated successfully by medical or surgical intervention or both. Uniformly thin and spherical rims are characteristic of cerebral abscesses. Nevertheless, a variety of tumors, including gliomas and metastases, can present a similar appearance and both frequently are treated surgically, regardless of the MR findings. Many abscesses, however, can be aspirated with CT or MR guidance and successfully treated with antibiotic therapy. Therefore, it would be beneficial to patients to establish an early and correct diagnosis. The MR features of brain abscesses vary with lesion stage. During the initial cerebritis stage, an ill-defined subcortical hyperintense zone on T2-weighted images is associated with poorly delineated enhancing areas within the iso- to mildly hypointense edematous region on enhanced T1-weighted images (1). During the early and late capsule stages, the collagenous abscess capsule is visible on unenhanced scans as a comparatively thin-walled, well-delineated iso- to slightly hyperintense ring that becomes hypointense on T2-weighted sequences (1). Nonetheless, a ring-enhancing mass is a nonspecific imaging finding that can be seen in various noninflammatory benign and neoplastic processes. The differential diagnosis includes primary brain tumors (eg, necrotic glioblastoma), metastases, resolving hematoma, infarction, and even demyelinating disease (1). In our two reported cases of cerebral abscesses, the CT and conventional MR images were also nonspecific. Proton MR spectroscopy also has been used in the characterization of intracranial mass lesions. Poptani (2) reported that the presence of cytosalic amino acid residues, along with lactate and acetate, suggests the lesion is an abscess. Lactate levels, however, also are increased in gliomas, schwannomas, and epidermoid cysts. In another study of brain tumors with proton spectroscopy, Ott (3) reported the presence of n-acetyl aspartate, choline, creatinine, and lactate in a single case of abscess. These discrepancies may be attributed to partial volume effect. The reports of Poptani (2) and Schumacher (4) suggest that localized proton MR spectroscopy may be a specific test for the identification of abscess. Diffusion-weighted MR imaging also was used occasionally in the diagnosis of cerebral abscesses. In 1996, Ebisu (5) reported a case of brain abscess (Streptococcus intermedius) with a high signal intensity in the abscess cavity on diffusion-weighted images associated with a low ADC value (0.31 × 10–3 mm2/s). 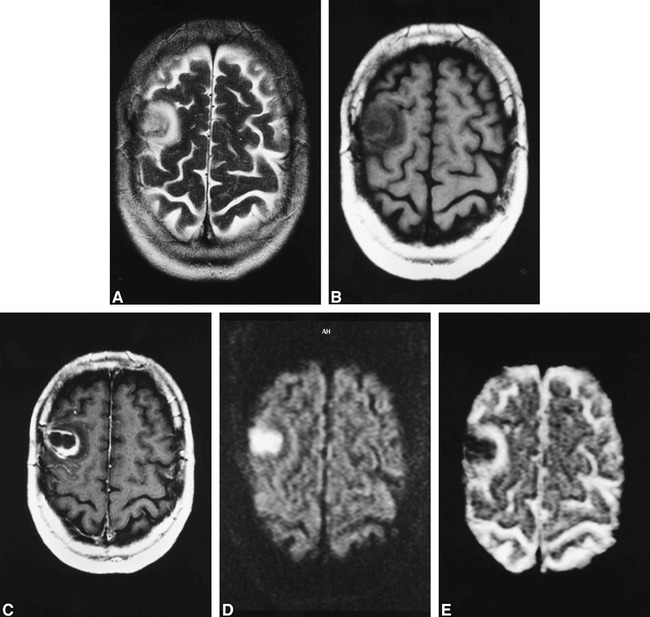 He concluded that diffusion-weighted imaging might enable one to distinguish brain abscesses from cystic or necrotic tumors. Nevertheless, in 1997, Krabbe (6) reported another case of abscess with low signal intensity in the abscess fluid and a high ADC value. Our results, as well as those reported by Ebisu, are in contradiction with the ADC value for an abscess as reported by Krabbe. A possible explanation for this discrepancy may be a partial volume effect (ie, only one 8-mm slice was used for diffusion-weighted imaging and contamination by surrounding edema is possible) or motion (examination time of 30 minutes with motion-sensitive spin-echo technique). In our study, the slice thickness was 6 mm and the number of slices averaged 15, which minimized the effects of partial volume and eventual motion between conventional MR (used for selection of diffusion-weighted imaging in study of Krabbe) and diffusion-weighted imaging. Diffusion-weighted MR imaging is reported to be highly sensitive and specific for the diagnosis of acute cerebral infarction (7–10). Lövblad et al (11) reported only two false-positive findings in 194 cases of acute ischemic stroke. One false-positive finding was a cerebral abscess, and the other was a brain tumor. ADC values, however, were not calculated in this study, and the T2 (shine-through) effect remains a possible explanation for these findings. The reported ADC values for acute ischemic stroke vary in value with time. Lutsep (10) reported 0.29–0.33 × 10−3 mm2/sec for ischemic lesions, studied less than 8 hours after symptom onset, .61 ± .14 × 10−3 mm2/sec at 8 to 24 hours, and .51 ± .18 × 10−3 mm2/sec at 1 to 8 days. Mean normal ADC values for the entire group (n = 26) were .88 ± .12 × 10−3 mm2/sec. In our cases, the mean ADC values in the central part of the abscess were 0.29 and 0.27, respectively. These values are ± 50% lower than those 8 hours after an ischemic stroke. Our results and the literature support the idea that reduced ADC values in the central part of the abscess are related to the presence of pus. Ebisu (5) also performed an in vivo diffusion-weighted imaging of aspirated pus, as well as ADC measurements. The pus imaged in vitro showed high signal intensity and very low ADC values, consistent with the results of the in vivo study. He concluded that the pus structure itself is responsible for the low ADC values, and that the heavily impeded water mobility of pus may be related to its high cellularity and viscosity. The presence of large molecules, like fibrinogen, also may play a key role in restricting the diffusion of pus (12). On the other hand, the cystic or necrotic components of tumors show a marked signal suppression on diffusion-weighted MR images, similar to that of CSF, and the calculated ADC values are in the range of 2.2 ± 0.9 × 10−3 mm2/sec (13). We also retrospectively reviewed the diffusion-weighted images and ADC maps of intracerebral tumors with a ring-enhancing presentation on CT and conventional MR studies (six glioblastomas, two pilocytic astrocytomas, and two metastases). All of them also showed increased diffusion of necrotic/cystic components (Figs 3 and 4). 60-year-old man with glioblastoma multiforme. 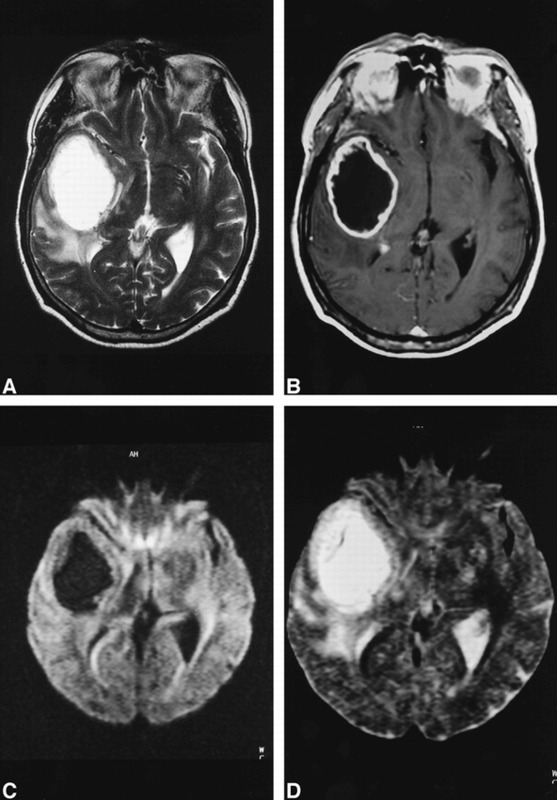 A—B, Using T2-weighted fast spin-echo (A)(6000/128/2/6) and enhanced T1-weighted spin-echo (B) (600/14/2/6) imaging, differential diagnosis between glioblastoma and abscess is impossible. C—D, Diffusion-weighted (“z” sensitizing direction) multishot echo-planar images (800/123/5/6) (C) and corresponding ADC map (D) show central hypointensity on diffusion-weighted image and hyperintensity on ADC map consistent with diagnosis of tumor. 57-year-old woman with cerebral metastasis. A—B, On T2-weighted fast spin-echo (A)(6000/128/1/6) and enhanced T1-weighted spin-echo images (B) (600/14/2/6) the differential diagnosis between metastasis and abscess is impossible. C—D, Diffusion-weighted (“z” sensitizing direction) multishot echo-planar image (800/123/5/6) (C) and corresponding ADC map (D) show central hypointensity on diffusion-weighted image and hyperintensity on ADC map consistent with diagnosis of tumor. Brain abscesses are potentially fatal lesions, and a correct diagnosis should be established as soon as possible. Establishing the differential diagnosis between intracerebral necrotic tumors and cerebral abscesses is frequently impossible with conventional MR imaging. Our experience, along with that of Ebisu, suggests that diffusion-weighted MR imaging and ADC maps are very useful in the differential diagnosis of ring-enhanced cerebral masses. The presence of central hyperintensity on diffusion-weighted MR images and very low ADC values strongly suggest the presence of pus and abscess. The differential diagnosis includes acute infarction, which also shows hyperintensity on diffusion-weighted MR images and reduced ADC values. Nevertheless, the ring enhancement in acute ischemic stroke is very unusual, and ADC values are higher after 8 hours. 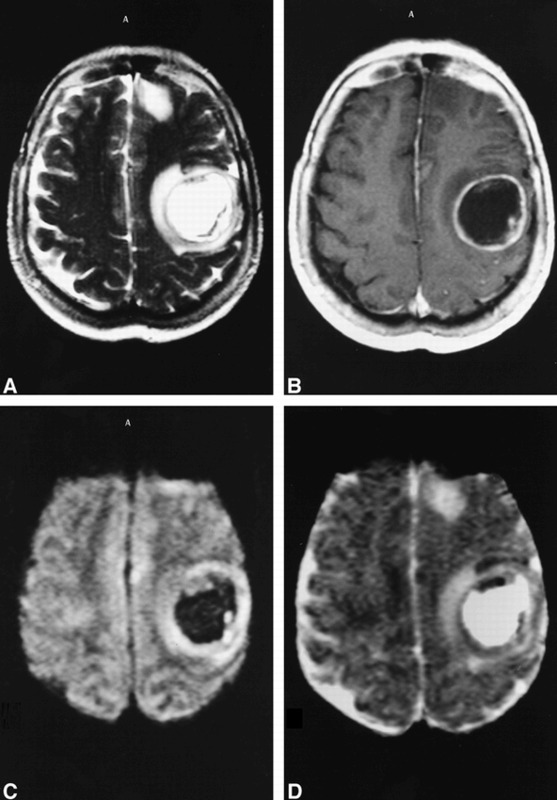 The ring-enhancing mass with central hypointensity on diffusion-weighted MR images and an increase in ADC values suggest necrotic tumor, most frequently cerebral glioma or metastasis. For these reasons the diffusion-weighted images and calculations of ADC values should be performed in all cases of ring-enhanced cerebral masses. ↵1 Address reprint requests to Brigitte Desprechins, MD, Department of Radiology and Medical Imaging, University Hospital V.U.B., Laarbeeklaan 101, 1090 Brussels, Belgium.